YUMMRAJ super loved the almost authentic North east Lunch at this ‘home like’ restaurant run by a couple from the North eastern States. A paradise for Food lovers & for food adventurers, appreciating the food here might turn out to b a challenge for those not having a wide palate. As always YUMMRAJ walked into the restaurant like a normal guest , ordered food, waited for it to arrive , ate it , paid for it & left. 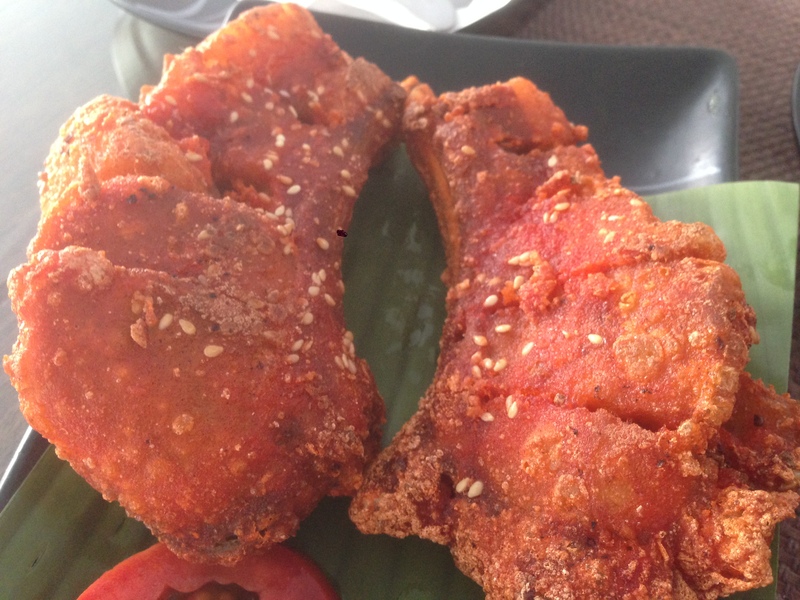 The only additional activity that happened was a chat with the owners of this restaurant – not coz they knew YUMMRAJ / got to know that YUMMRAJ is in the restaurant but bcoz they habitually go to every table & talk to them about themselves, the restaurant, the food & ‘where did u get to know about us’. 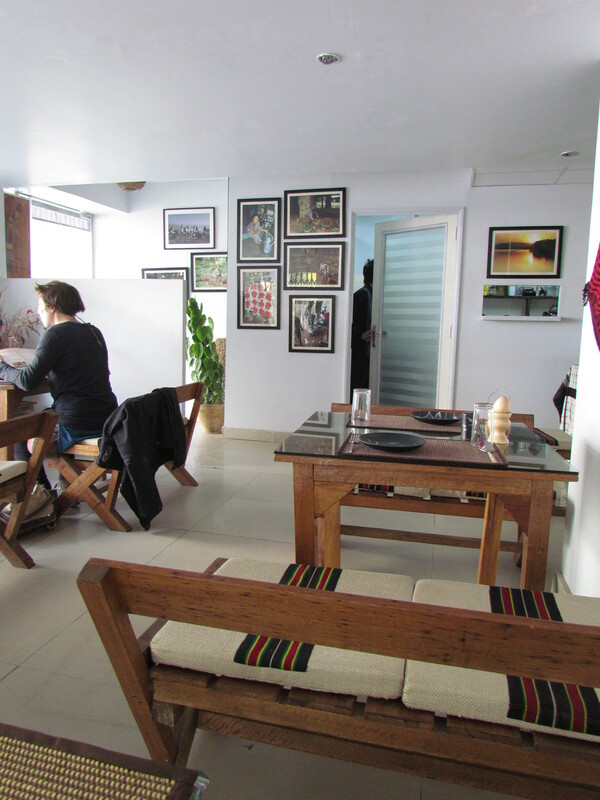 As mentioned above, this café is run by a couple from the North eastern States. The Husband is in charge of the Kitchen while the wife is the one who interacts with the Customers. She is a Mizo brought up in Manipur. Since we had quite a long nice chat with her, we requested her & she called in her husband from the kitchen as well. Had a great chat with him as well. They started the first Rosang Café many years back in North Delhi, opened a branch in Safdarjung, opened & shut a restaurant in Hauz Khas Village & now freshly opened this restaurant in Green Park extension. 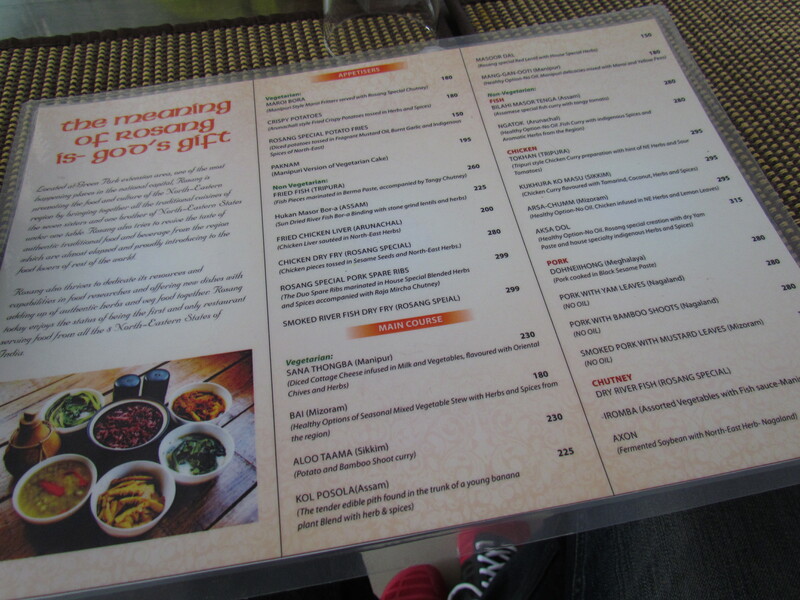 Menu card has items from different states of north east (Sikkim, Assam, Manipur, Mizoram, Meghalaya, Nagaland, Tripura, Arunachal pradesh)*. There r almost no other restaurant in Delhi that covers all the states. If u know about some, pls put in the info in the comment box. 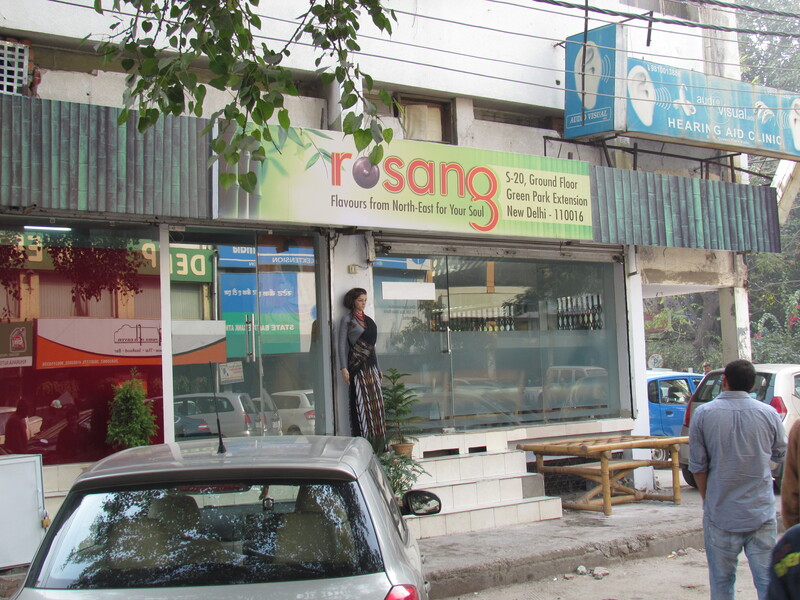 Rosang had quite a few items on the menu that I have not seen in Delhi so far. *Though it might sound ironical, I just listed the states covered coz I have come across many people in Delhi NCR who r unable to verbally list down all states of North east. Food takes time to come coz everything seems to b made from scratch. 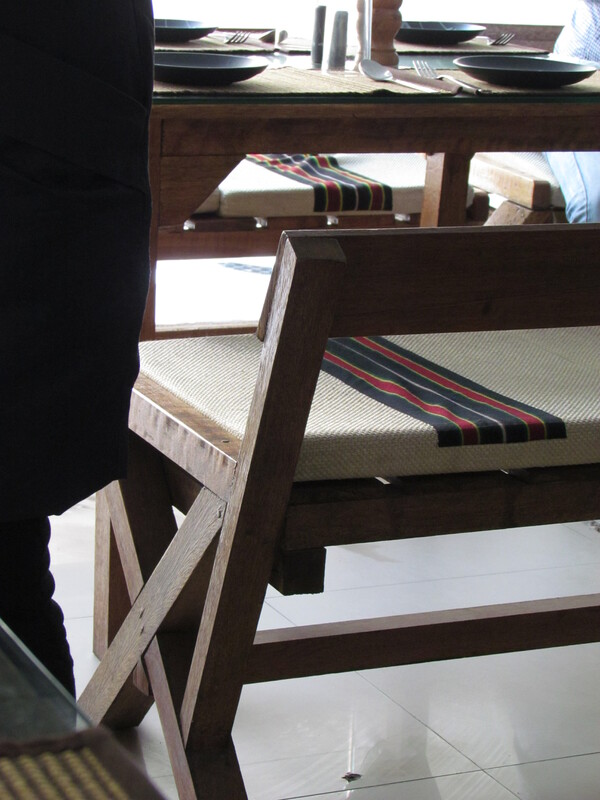 Also, the café was just 5 days old when we visited & things were falling in place. I guess things wud improve on this front in future. Infact the joke was – food takes do much time that u can place orders, walk to dilli haat, do shopping, come back exhausted & enjoy ur freshly prepared lunch. The Kitchen was just beside the dining hall. We cud look into it thru a small window. Pretty neat & clean I wud say. 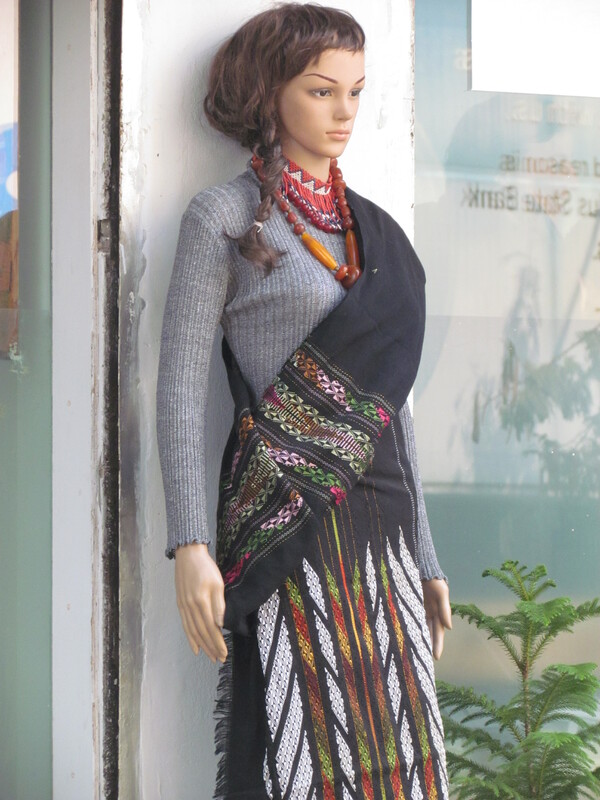 Outside the café we saw a mannequin wearing North east traditional Dress. 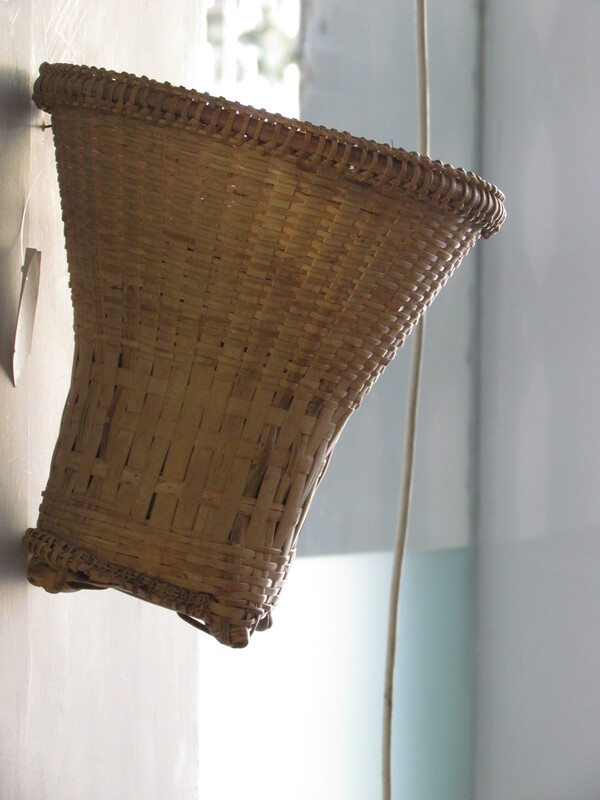 Lots of small handicraft pieces from the North eastern States were hanging on the wall. A part of the wall had many bound photographs arranged in a nice way. 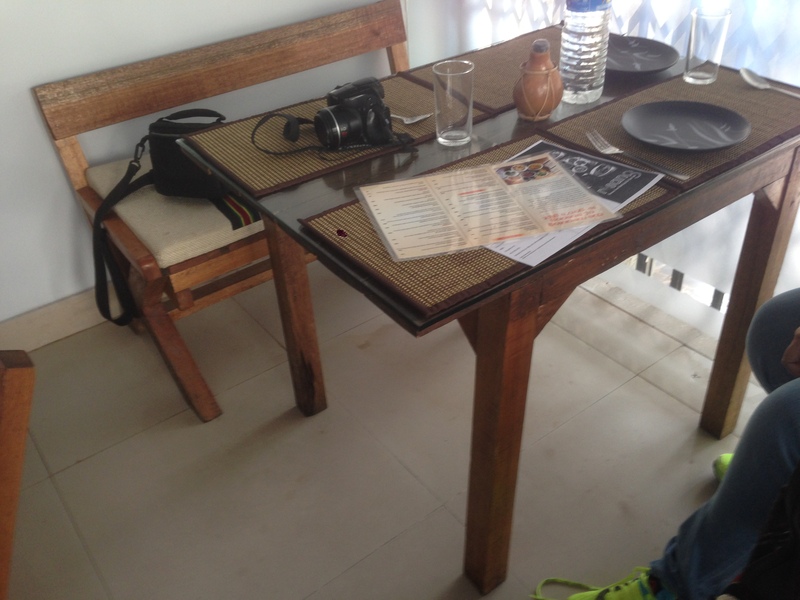 The furniture was basic wood but was simple & utilitarian. When we were searching for the place by calling the number provide in the facebook page of the restaurant, we came across the wrong guy. He had a full conversation with us & then the chap said restaurant is shut. We said that we heard the restaurant has reopened in Green park & then he corrected himself immediately & said ‘maybe’. We somehow reached the restaurant by asking people & then after talking to the owner we realized that the old restaurant phone number was still on Facebook. The lady corrected that immediately. 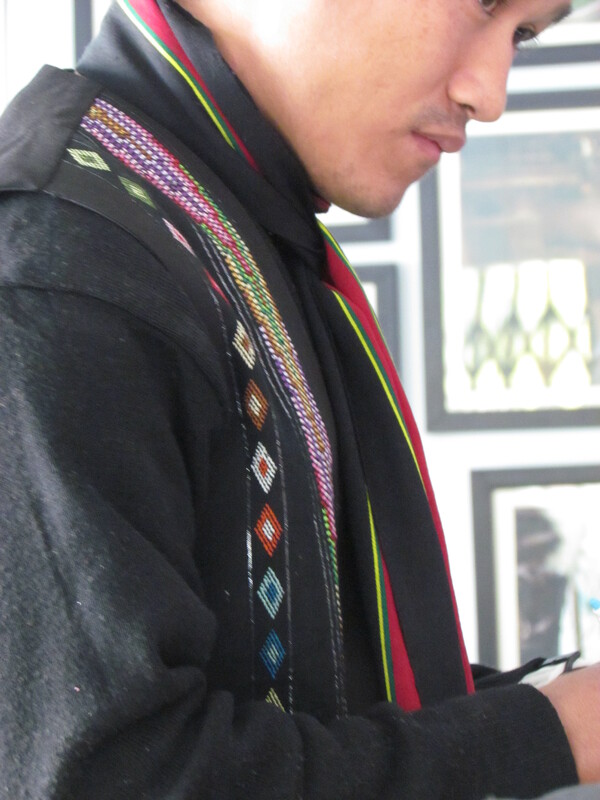 The staff were in a North east traditional topwear. They were very nice, warm & served us well. 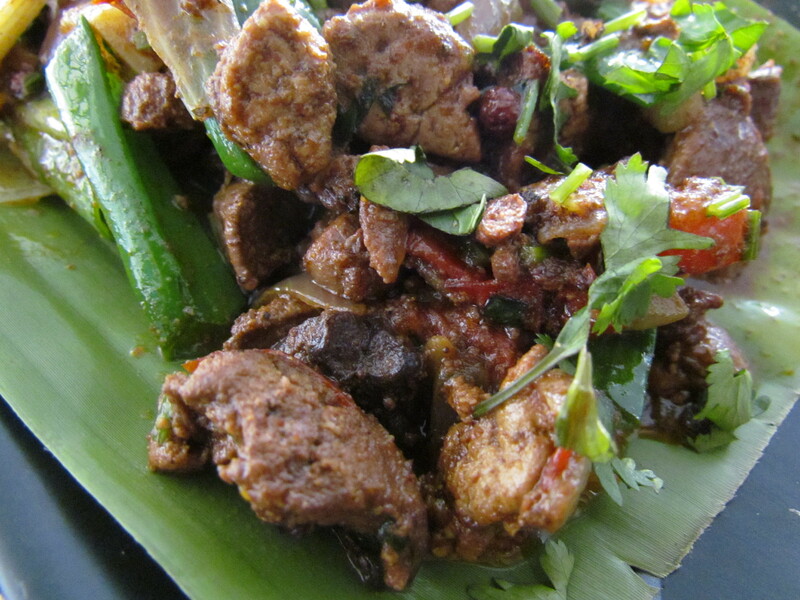 We started our lunch with Fried Chicken Liver Arunachal style – Chicken liver sauteed in North East Spices. The Chicken liver was very soft, turned to a pâté kind of texture when in the mouth & tasted awesome with the combination of the veggies and spices. 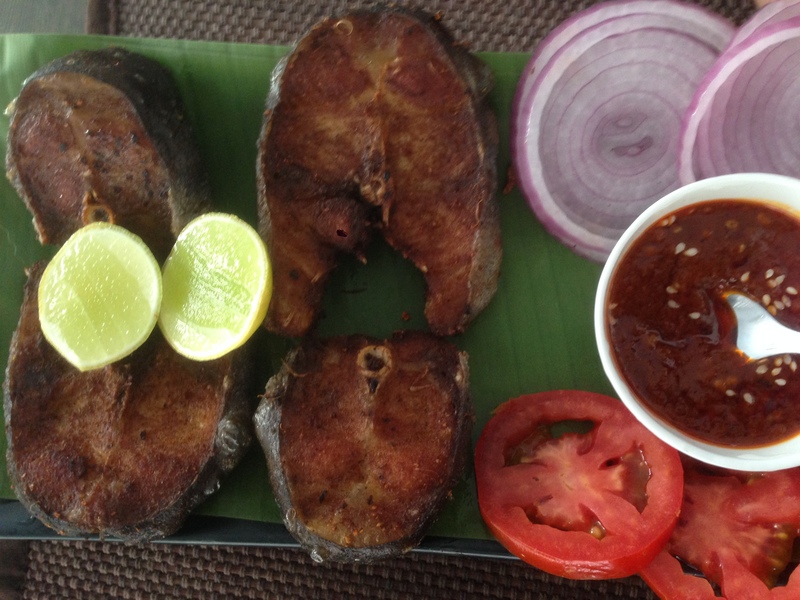 A full spice came up in the mouth and as we wud bite it, a flavor wud burst out inside the mouth. 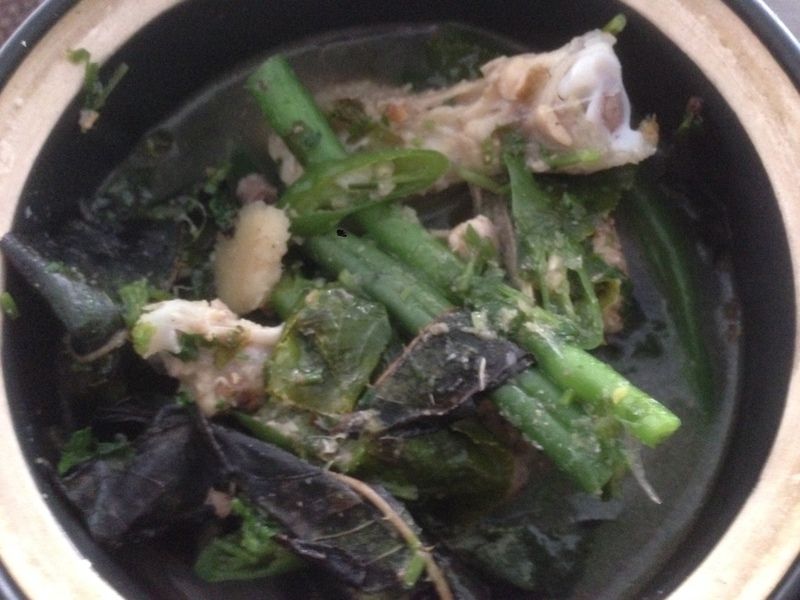 The strong flavor was tending towards pungent & hot. Reminded me of tiger pepper that I had in china. I liked this dish very much and rate it 4/5. 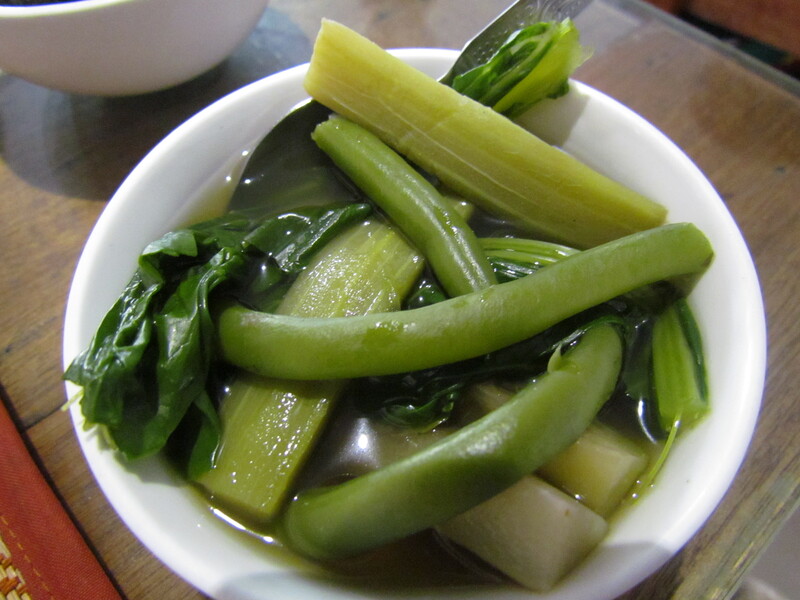 We ordered a vegetarian food named Bai which the menu card described as ‘seasonal mixed veg stew with herbs and spices from Mizoram’. 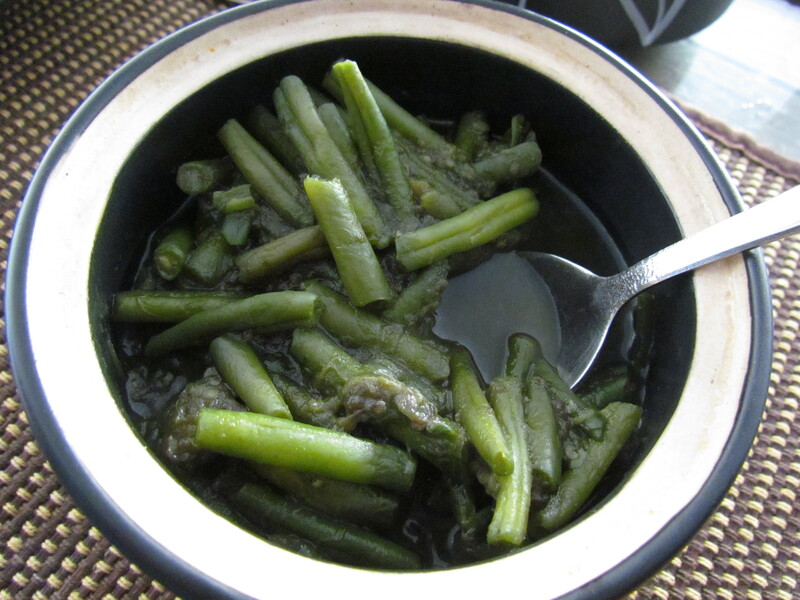 When it arrived on the table it looked like a bunch of green french beans in some kind of steamed form. A dig in with the spoon made us realise there was something else in the base. 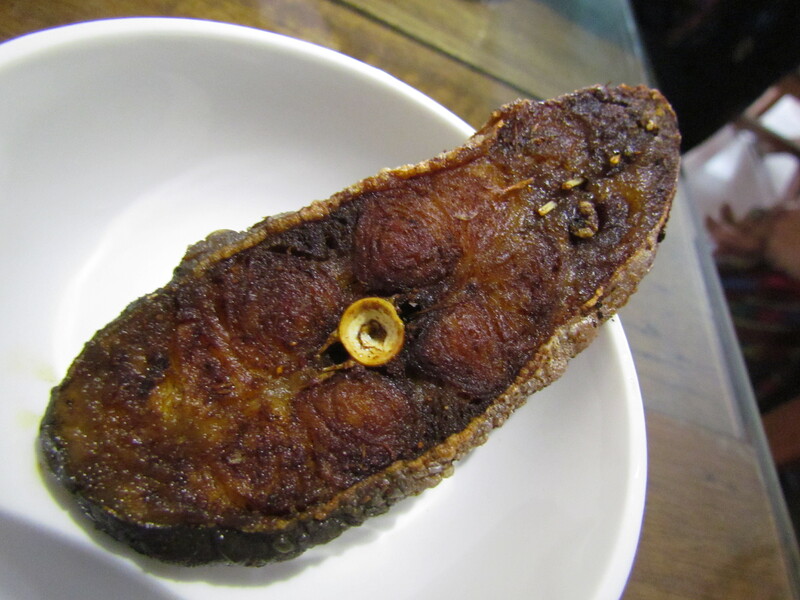 Once in the mouth, we got it – aubergine. The aubergines had almost become paste like in the base of the thin gravy thus making it a bit thick. Superb flavors of Spices . Crunchy French Beans. Very simple, very Subtle but very tasty & adequately flavorful dish. Loved it & rate it 4.25. 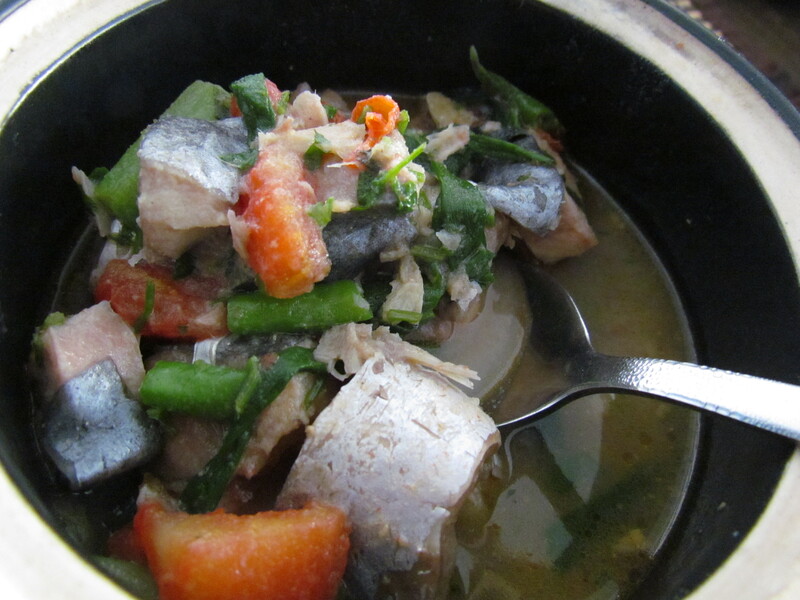 The next dish we had was Ngatok from Arunachal Pradesh again. 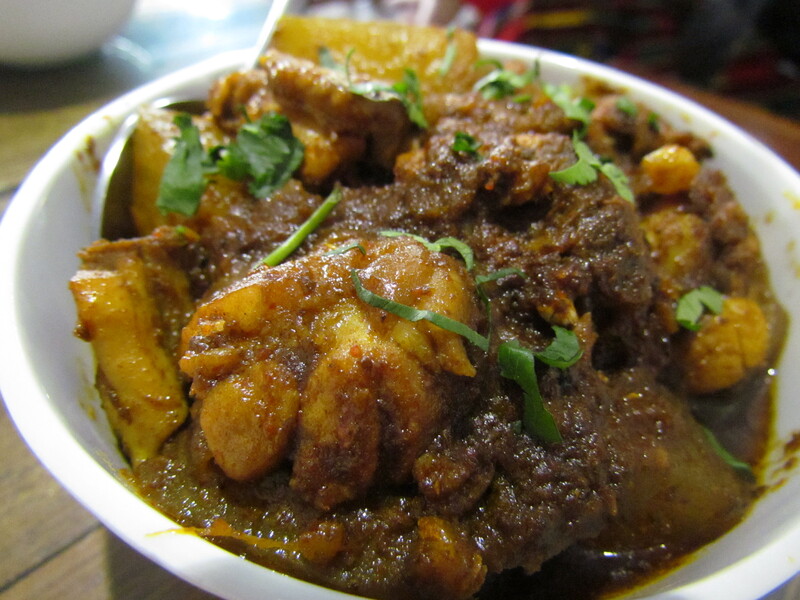 The menu card describes it as a no oil fish curry with indigenous spices & aromatic herbs. 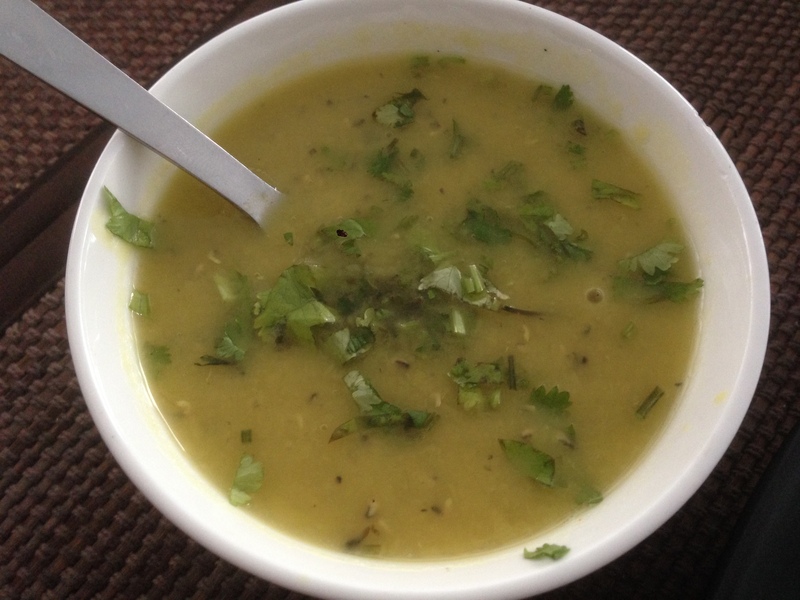 This simple, thin gravy was again very tasty & bursting out with flavors. Unputdownable. As of now they r unable to source dry fish. Look forward to trying some of these very interesting dry fish based dishes on the menu next time. 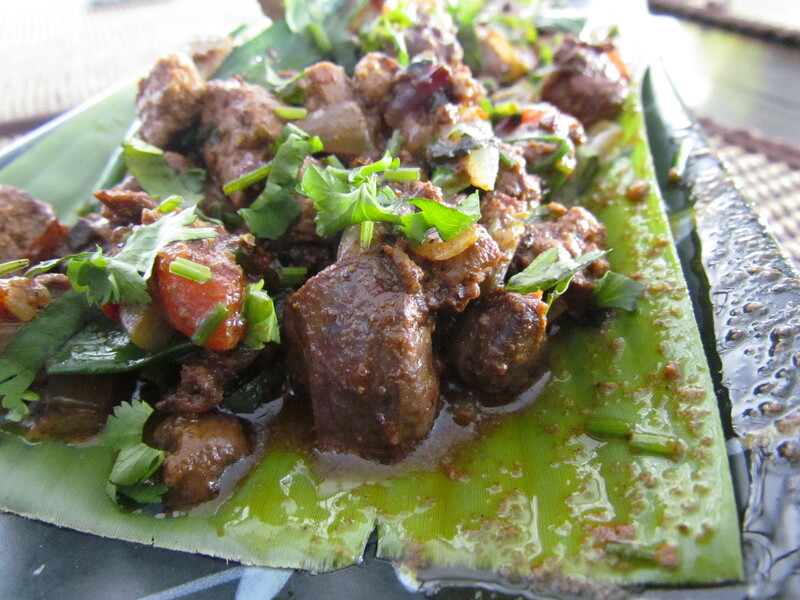 We then moved on to Dohneiihong – A Meghalaya style pork cooked in black sesame paste. This was again very different from the rest of the dishes so far coz this had more oil in it & was pretty strong in terms of taste & flavor. Loved the gravy. 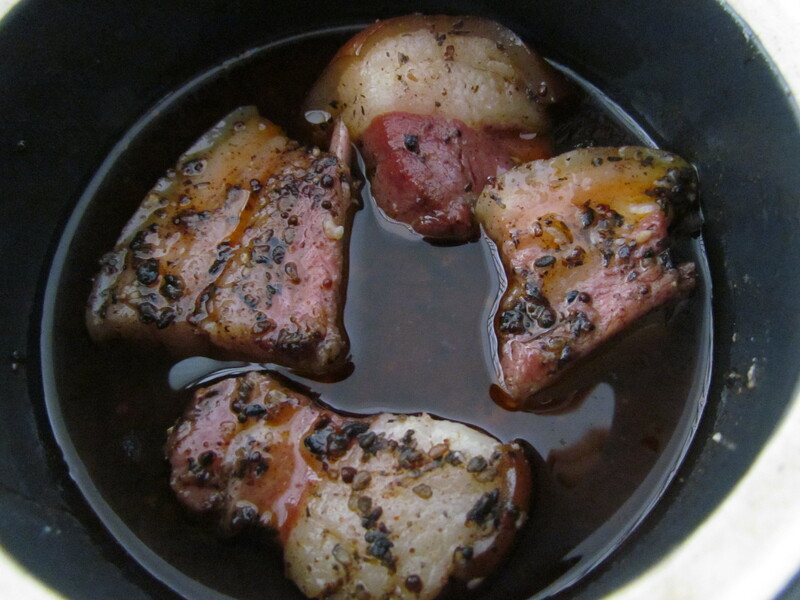 Though this was the only gravy that cud not b had just like that due to high content of oil (animal fat & oil) – it had to b had with plain rice (North east white rice / red rice, not basmati). 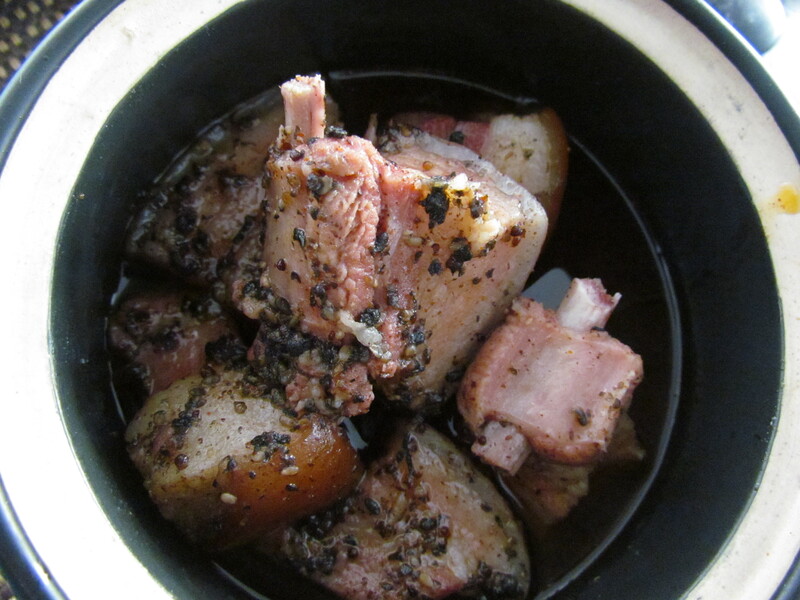 The pork pieces had their share of fat in them & had very soft meat. One cud easily separate the fat from the meat. I enjoyed the fat with the meat. Rate this dish 4.5/5. 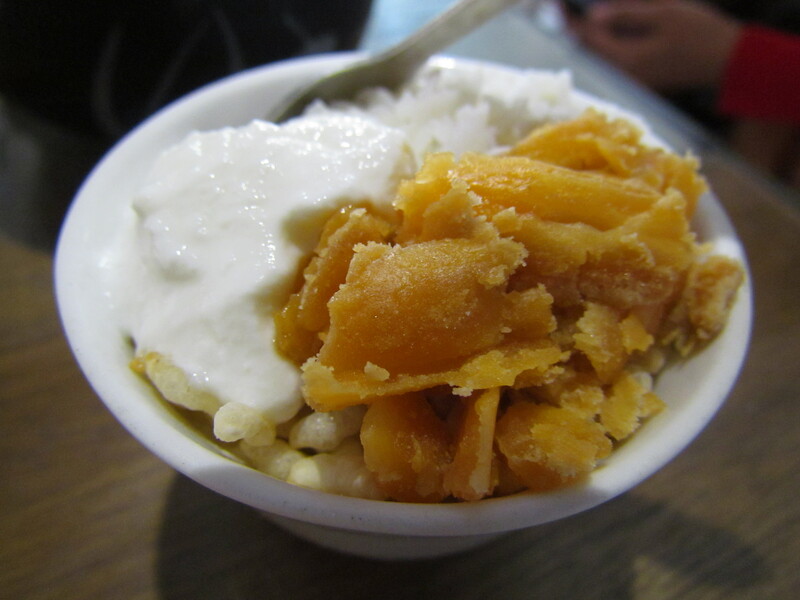 We also tried an amazing rice dish that gave us as much joy as having say the best Awadhi Biryani. 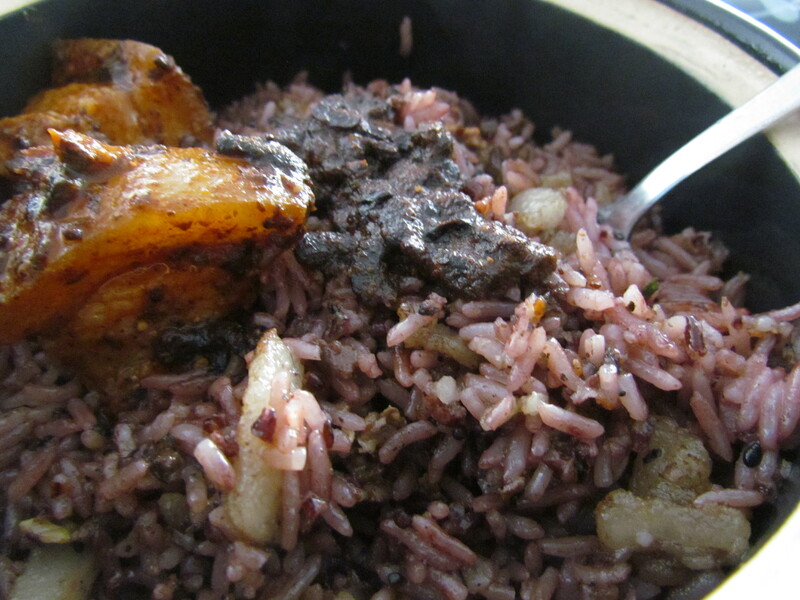 It was Wild red rice with pork and herbs. 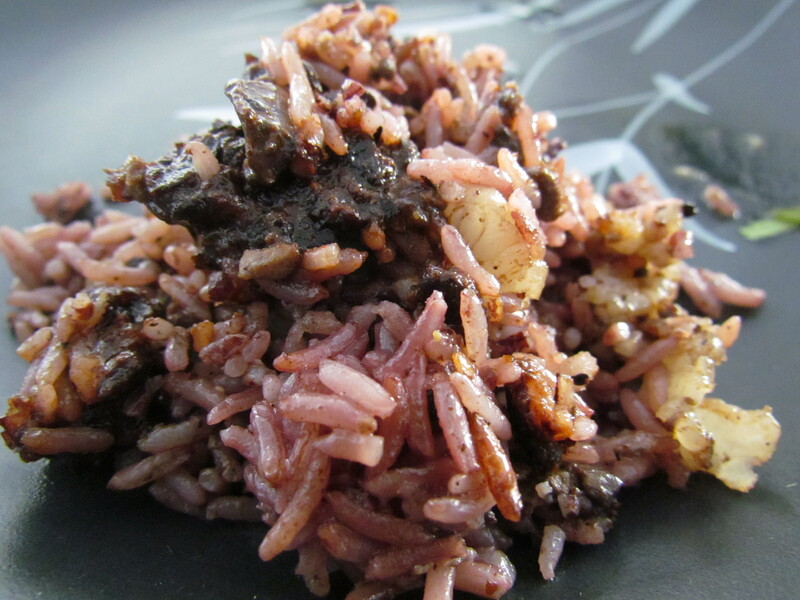 The red rice if used in entirety makes this dish almost like sticky rice. However in previous experience the restaurant owners have found that not too many people liked it. 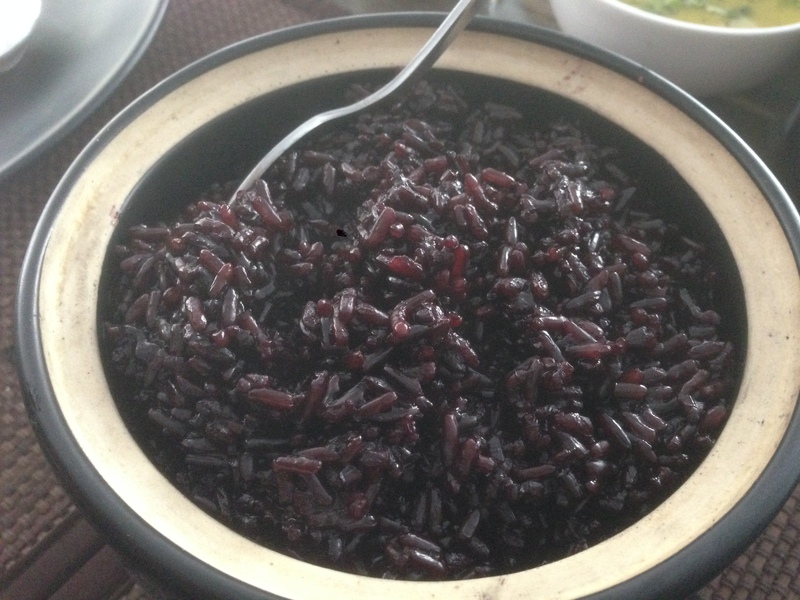 So they have started mixing red rice with a bit of rice from here – As told by the lady during her chat with us. 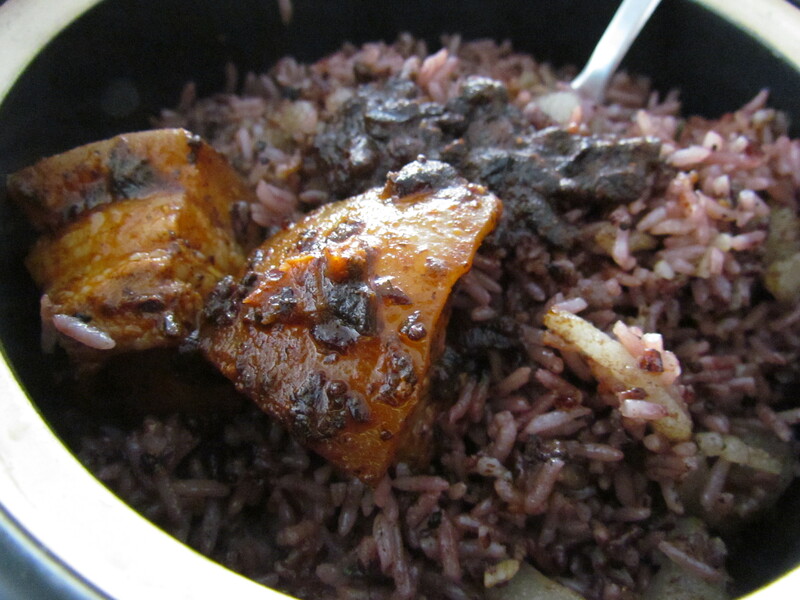 The rice was soft but chewy & thoroughly enjoyable. The flavors of meat & spices were bursting out. 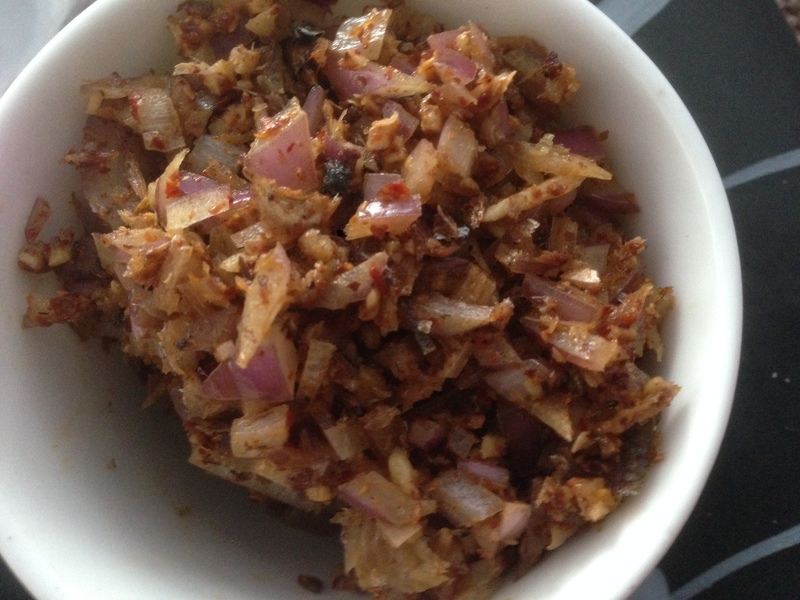 The taste was perfect in terms of seasoning & also as a dish. The herbs made a massive difference to the dish. 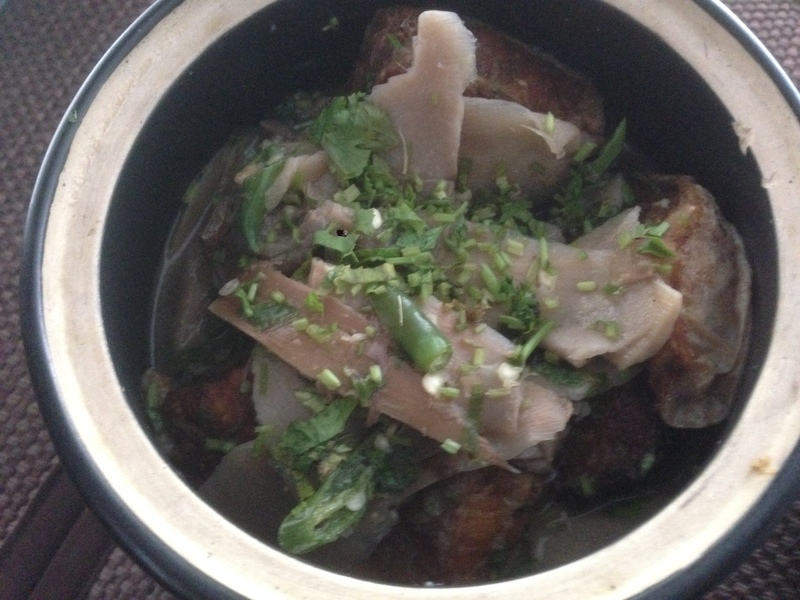 Shredded pork was all over the rice & that added a zing to the bite – every bite wud b different. 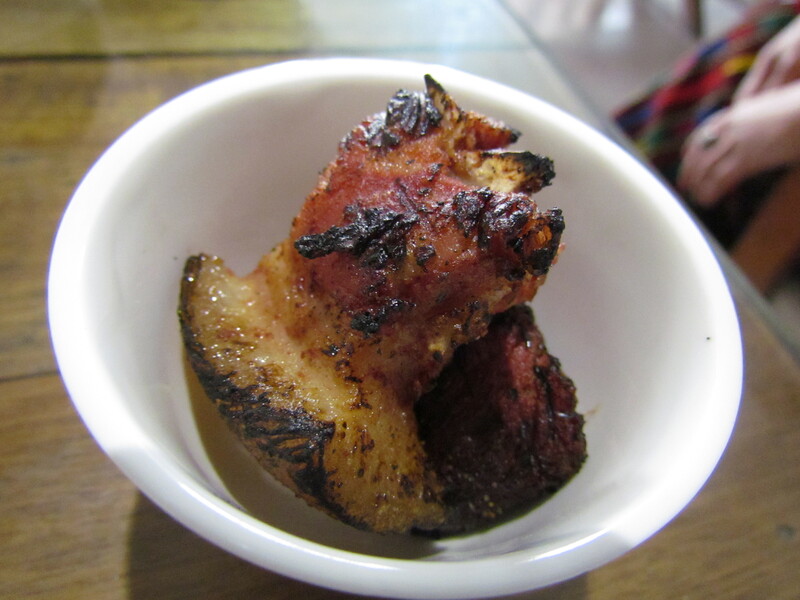 Pork pieces were also there & they were good. Super loved this & rate it 4.75/5. Look forward to trying the Smoked pork with mustard leaves next time. 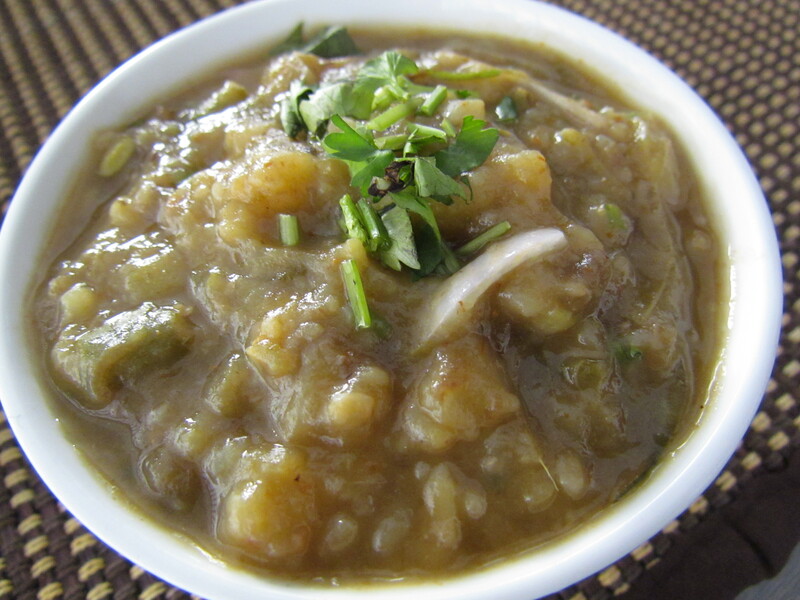 We also tried a chutney from Manipur named Iromba – Assorted vegetables with fish sauce. Loved that simple flavorful dish. Rate it 4/5 again. We finished the lunch with a cup of red rice tea for which they did not charge us – coz we had placed order after the bill was prepared. Loved it as it was. 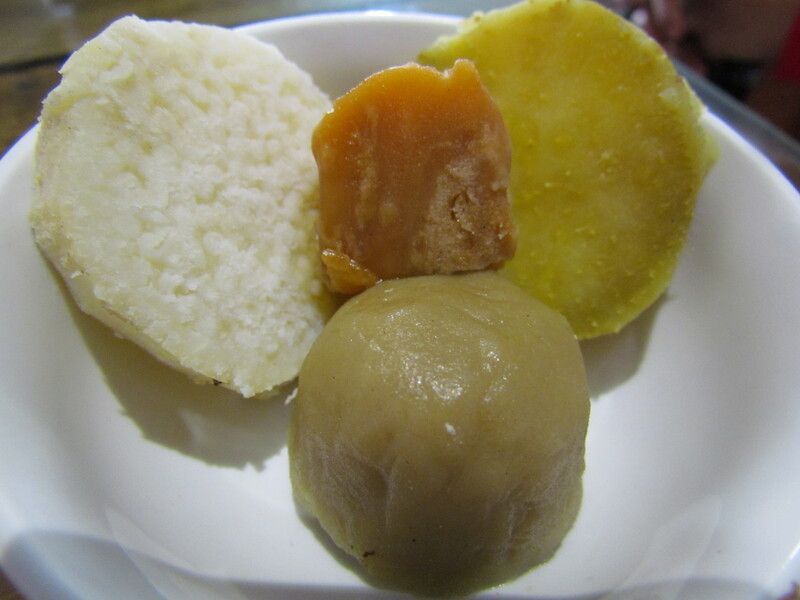 In the North east this is enjoyed with sugarcane Gur as sweetener. Here it was served with normal white sugar. We were told Gur is onway & will b in the menu card in a short time. 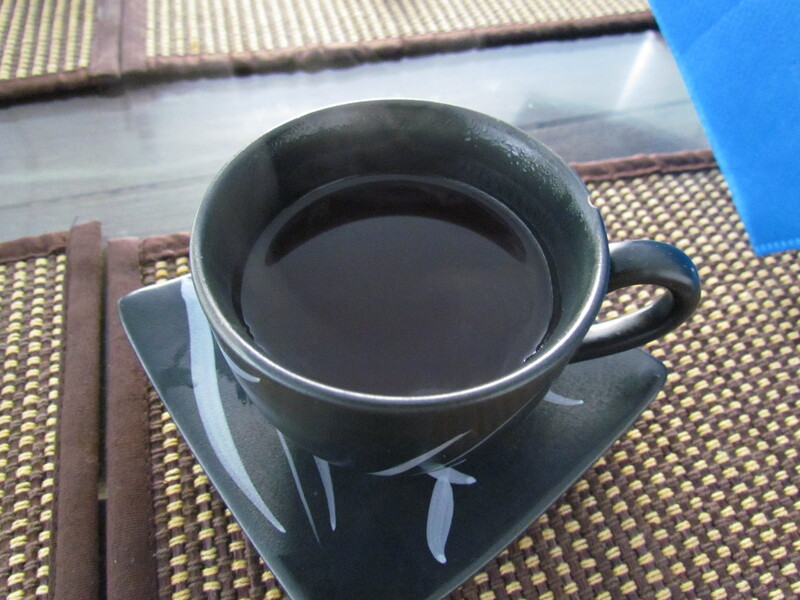 Loved the red rice tea. 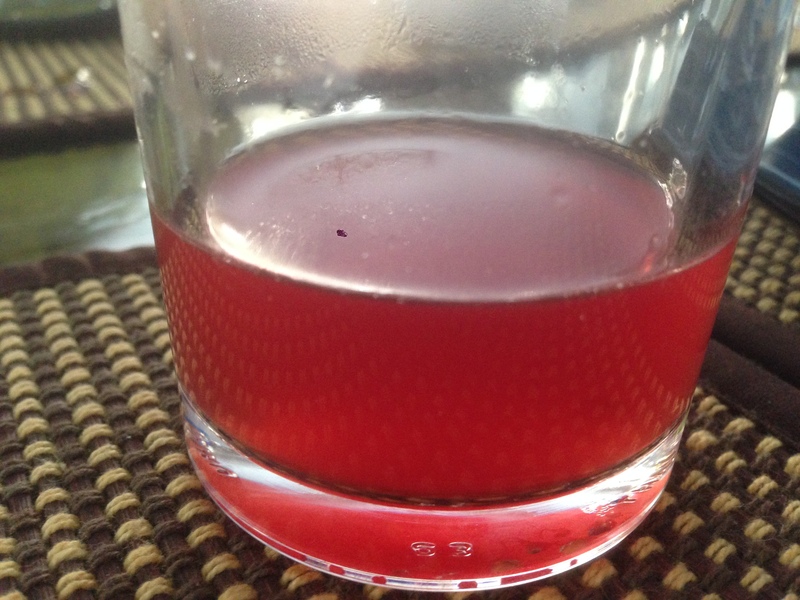 It was actually red in color like a cranberry juice. Lemon was added to it b4 serving. Since I had it without sugar, the drink served as a palate cleanser. Next time I will order it with the food & enjoy it as a palate cleanser as well. Rate it 4.25/5. 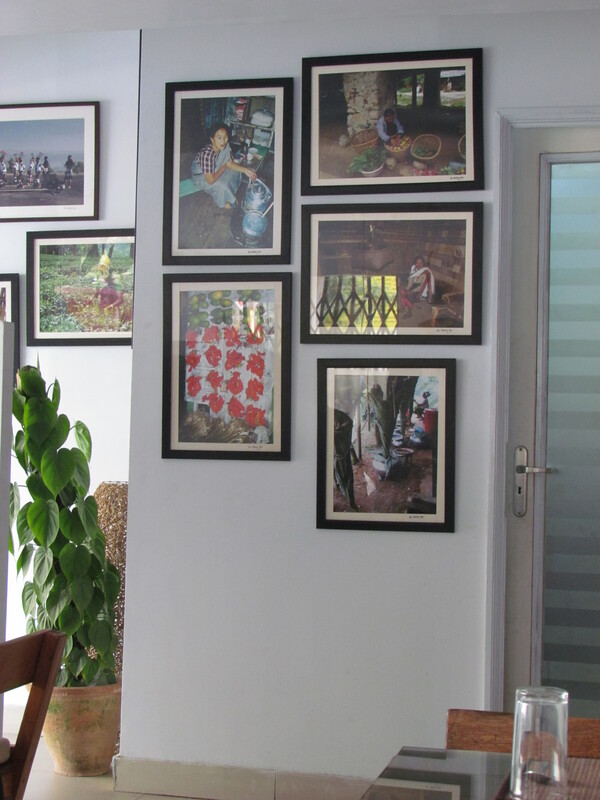 Overall rating of food at Rosang Café averages out to 4.3/5. 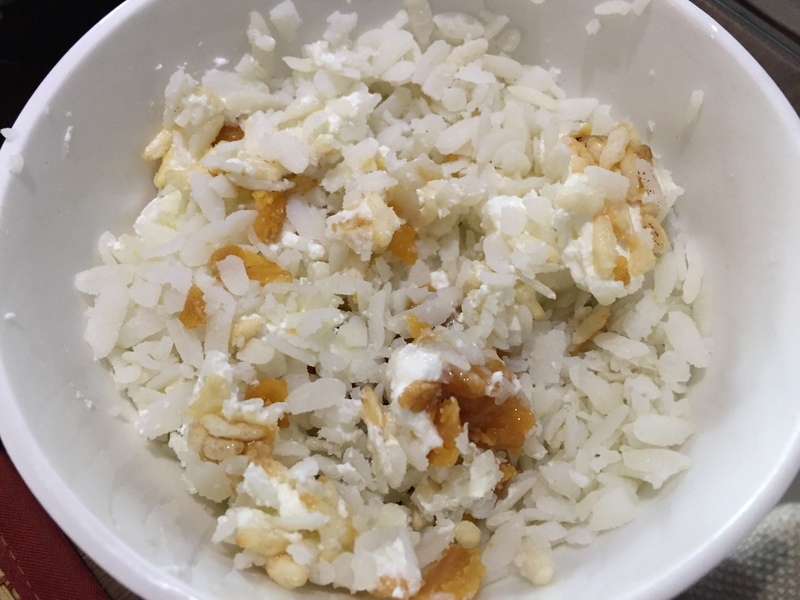 What I loved most was the totally different flavors & taste than what is usually available in Delhi & not only different but thoroughly enjoyable. Look forward to get back here very soon. 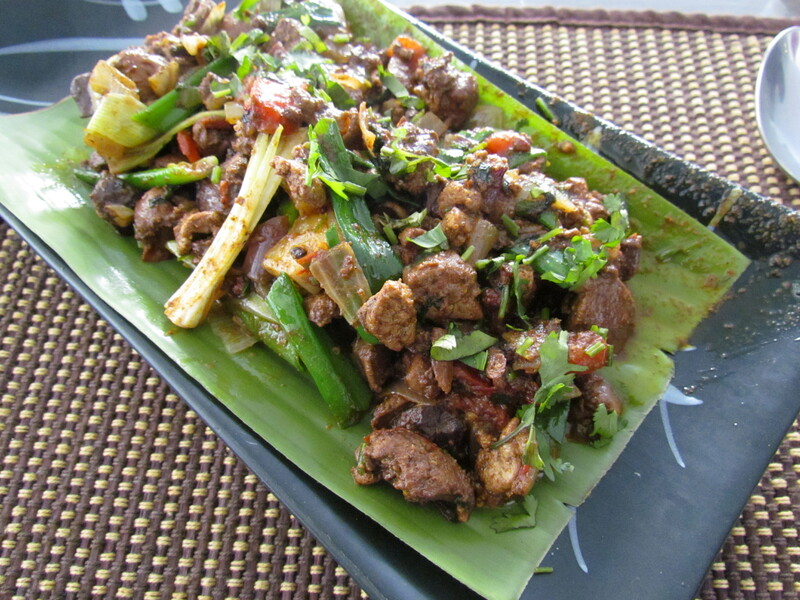 Previous Post: Rajasthan Food Restaurant (Culture Gully, Kingdom of dreams, Gurgaon). Isn’t there another North-east place outside Uphaar? I remember going there, bit don’t remember looking like this on the inside. 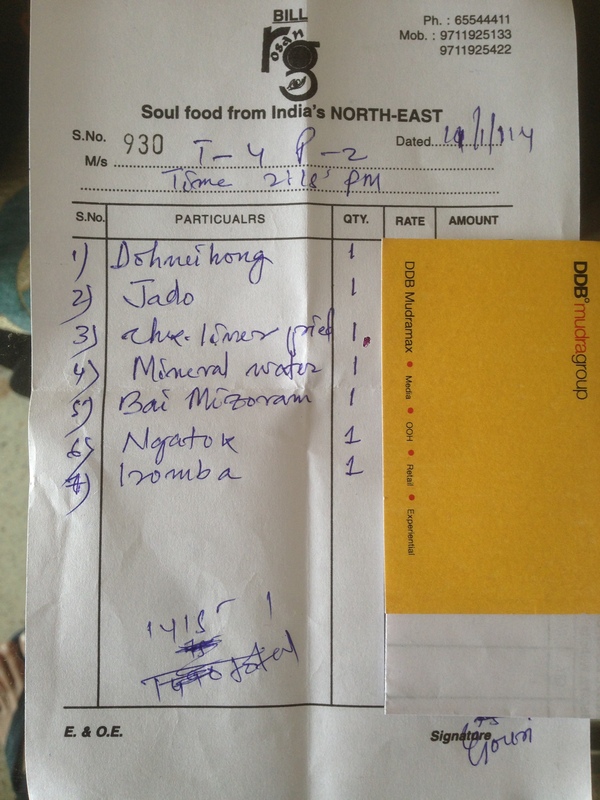 yes, that is a Nagaland cuisine restaurant.